Incidents like the Imperial Sugar explosion in Georgia and the West Pharmaceutical explosion show the complexity and explosive power of combustible dust. Large amounts of sugar dust that was both airborne and accumulated on surfaces resulted in several explosions. The Imperial Sugar plant was destroyed, fourteen employees lost their lives and 36 were injured. The incident at West Pharmaceutical was caused from accumulated fine plastic powder that accumulated in the ceiling areas. The plant was destroyed, six workers died and 38 were injured. Many people are unaware of the explosive power of dust originating from harmless products such as sugar or grain. Combustible dust hazards, fires and/or explosions are serious and can result in fatalities, injuries and catastrophic loss of property. Agricultural, food processing, pharmaceutical, metal processing, 3-D printing, wood and paper generation, power facilities, and recycling are just a few of the industries that are subject to dust hazards. In fact, dust hazards can occur in almost any industry and unfortunately are one of the commonly overlooked areas of safety that can lead to fires, explosions, injuries or fatalities. The U.S. Chemical Safety & Hazard Investigation Board estimates that between 1980 and 2012, there were 331 combustible dust incidents, resulting in 148 deaths and 879 injuries1. The term combustible dust refers to any dust that accumulates and becomes a fire or explosion hazard. Some materials are not harmful or hazardous in larger pieces (such as aluminum), but can become a hazard when finely ground into dust particles. The potential for combustion occurs once they have dispersed in the air. According to OSHA, combustible dusts are usually organic or metallic materials that are finely ground into small particles of dust. These solid materials are composed of distinct particles or pieces, regardless of size, shape, or chemical composition, which present a fire or deflagration hazard when suspended in air or some other oxidizing medium over a range of concentrations. Dust can easily accumulate in areas that are not visible (ceiling areas, high ledges, on equipment, duct work, or stacked materials). 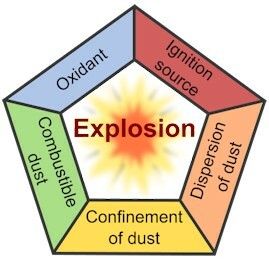 A dust explosion pentagon is used to show the factors needed for a dust explosion to occur. The pentagon is used similarly to the way a fire has the fire tetrahedron representing the four factors necessary for a fire to occur. 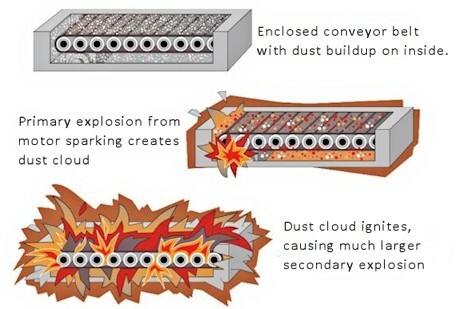 The dust explosion pentagon includes three of the factors necessary for fire: fuel, ignition source, and an oxidant, plus the factors of dispersion of dust particulates and the confinement of the dust cloud. Removing any one of these elements would make it difficult for an explosion to occur, even though a fire could still happen. Some factors may not be obvious, for example, an oxidant could be chlorine instead of oxygen, and the dust must be dispersed at the correct concentration in the air. Various settings may create an enclosure, such as a room, silo, bin, dust control equipment or filter. The ignition source could simply be heat or a spark. Combustible dust explosions typically cascade, or occur in two or more sequential events. The primary event occurs when accumulated dusts that are airborne or suspended meet an ignition or heat source. The dust ignites, resulting in a fire and possible explosion. 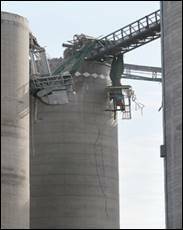 The force from such an explosion can dislodge and disperse additional dusts that have accumulated on surfaces, in processing equipment, or even dust collector systems. Once these combustible dust particles become dispersed and are fugitive they are able to ignite. This can result in one or more larger and more violent secondary explosions or flash fires. Due to the increased concentration of combustible dust particles in the air, secondary explosions can be much more destructive and deadly than primary explosions. The primary explosion dislodges accumulated dust on surfaces forming a dust cloud. A secondary explosion of this larger dust cloud can be ignited by the primary explosion. In order to identify the presence of combustible dusts, standards have been developed by The National Fire Protection Association (NFPA). The NFPA provides Standard 654: Standard for the Prevention of Fire and Dust Explosions from the Manufacturing, Processing and Handling of Combustible Particulate Solids and also NFPA 454: Standard for Combustible Metals, Metal Powders and Metal Dusts. NFPA Standard 654 provides extensive guidance and recommendations for dust control and a dust hazard analysis (DHA) plan. Minimizing the escape of dust from equipment and/or ventilation systems, installing dust collection systems and filters, utilizing surfaces that minimize dust accumulation, routine inspections for dust accumulation in open and hidden areas, and regularly cleaning dust residues are some of the recommendations by the NFPA to reduce combustible dust threats. OSHA is also conducting inspections with increased vigilance and enforcement of worker safety under the Combustible Dust National Emphasis Program (NEP). It is possible to reduce the likelihood or severity of a catastrophic combustible dust explosion incident. The value of performing a dust hazard analysis to identify the location(s) and level of risk a facility has for a combustible dust incident can not be overemphasized. Our team uses NFPA standards and OSHA regulations and guidance to perform a comprehensive analysis of dust hazards at the client’s location. In addition, we provide guidance and a site specific written plan to assist with corrective actions to reduce or eliminate consequences associated with potential hazards identified on site. Conducting a DHA is even more important when there has already been a dust explosion at a facility, since the causative factors for a first explosion may very likely still be present in other areas of that facility. Investigating a fire and/or explosion incident that may have involved combustible dusts requires a team of experts that understand complex site dynamics and can perform a comprehensive investigation. Understanding combustibility characteristics, dust explosivity and ignition energies associated with dust hazards, analysis techniques, and chemical and material interactions are crucial. Gossman Forensics has the technical ability to provide a complete analysis of the incident site whether investigating a facility in order to reduce the risk of an explosion or after an explosion has occurred.